Luigi Padovese, the apostolic vicar of Anatolia, was killed Thursday in Iskenderun, Turkey. (CNN) -- The driver of a slain Catholic bishop in southern Turkey has been apprehended in the killing, the Turkish Foreign Ministry said Thursday. 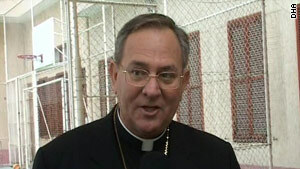 The victim was identified by the Vatican as Luigi Padovese, the apostolic vicar of Anatolia. He was assaulted Thursday in his house in Iskenderun in Hatay province, the Vatican said. "We were dismayed to hear that Bishop Prof. Luigi Padovese lost his life as a result of being stabbed by his driver today in Iskenderun, Hatay," the ministry said, saying the death is "a human, religious and academic loss." "This attack on a man of religion, whatever its reason might be, has received significant public condemnation. We have learned that the suspect, who has psychological problems and is currently being treated, was apprehended with the murder weapon. Detailed information will be shared with the public when the ongoing judicial investigation is concluded. "This murder has led to deep sorrow for everyone. Hoping that the deceased will rest in peace, we extend our most sincere condolences to his family, to our citizens of Christian belief and the entire Catholic community," the ministry said. "I can only express an immense pain over this violent act that has taken us by surprise," Vatican spokesman Father Federico Lombardi said. "The tragedy of this event shows the difficulty that the Christian community endures in the Middle East region." Roman Catholics in Turkey "occasionally have been subjected to violent societal attacks," according to the U.S. Commission on International Religious Freedom, a U.S. government agency. The group's latest report cites the February 2006 shooting death of "an Italian Catholic priest" in Trabzon by a boy "angered over the caricatures of the Muslim prophet in Danish newspapers." A 16-year-old boy was charged with murder and sentenced to jail in the act, which drew condemnations from Prime Minister Recep Tayyip Erdogan and other government officials. In July 2009, a "mentally disturbed young man" killed Gregor Kerkeling, a Catholic German businessman in what has been described as an anti-Christian hate crime. The suspect confessed.